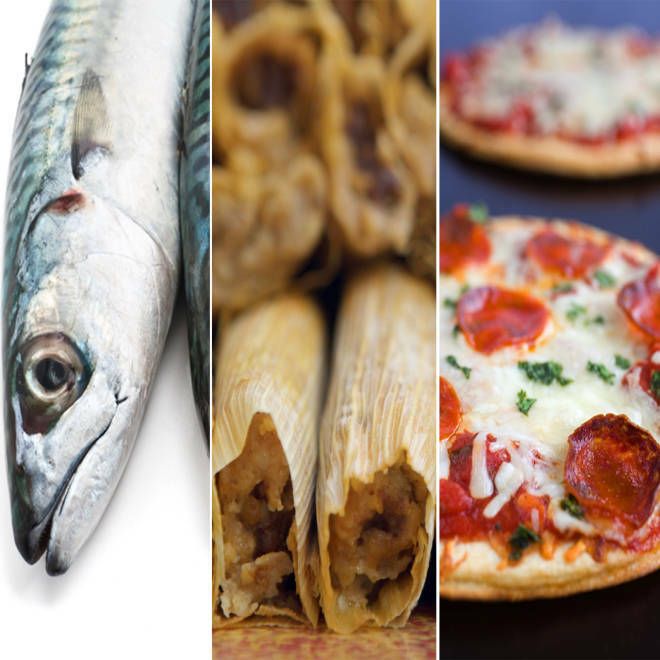 Chefs share their last meal choices -- Marcus Samuelsson talks mackerel, Amanda Cohen says tamales and Justin Warner goes with a classic pepperoni pizza. According to the ancient Mayan calendar, this Friday, Dec. 21, 2012, marks the end of the world. True, it's been debunked by scientists, but it’s still a good excuse to dream up your last meal. Would it be something grand and expensive? Perhaps you crave your mother’s home cooking, or the perfect loaf of bread you had in France decades ago. We took this opportunity to find out what some top chefs would have for their final feast. This former “Top Chef” contestant has four "end-of-the-world" meals, for four different scenarios. “For the Armageddon, I would want a juicy, double-bacon cheeseburger and French fries fried in beef fat,” he told TODAY.com. In case of the Rapture, classic spaghetti and meatballs would do. Finally, if the Mayans have it right, Blais said his last meal would have to be tacos el pastor -- tacos with rotisserie pork and pineapple. Burke wants his elaborate end-of-the-world meal to consist of a five courses, one for each decade he has lived. For his formative years, pancakes and caviar would do. From the ages of 11 to 20, Burke said he made a lot of soup, so he chooses a tomato bisque with “a funky grilled cheese.” Moving up, in his self-described “adventurous time,” he said, “I would have sea scallops Benedict and sea urchin with hollandaise.” His choice for ages 31 to 40 would be duck breast with ginger and jasmine tea and a leg of duck over a crisp salad. Finally, this decade brings him to 50, and for that he would have a chocolate stairway to heaven. Sean Brock: Chef and owner at McCrady’s and Husk in Charleston, S.C.
“I would have my mother make me some chicken and dumplings,” Brock told TODAY.com. “It’s my favorite thing to eat in the entire world. The original “Iron Chef” doesn’t want a lot of frills for his final eating challenge. "I would like to eat a simple, traditional Japanese meal that I would make for myself.” This means he would stick with white rice, miso soup, pickles and fresh fish, grilled. Justin Warner: Chef and co-owner of Do or Dine in Brooklyn, N.Y.
“In the event the Mayans are correct, I’ll have a pepperoni slice and a Dr. Pepper with my girlfriend at Tony’s on Kinckerbocker and DeKalb,” the Food Network Star winner said. Holzman’s last meal would also be fairly simple. He said all he wants is "a nice thick juicy rare New York Strip steak, a baked potato with sour cream and butter and a pint of cookies and cream ice cream for dessert." "Among all the amazing foods I've been privileged to have, nothing beats the taste of a good memory,” Samuelsson told TODAY.com, waxing poetically about his childhood. “For my last meal I would catch fresh mackerel near my home in Smogen [in Sweden] like I used to do with my father and uncle. Then, pan sear it with butter and some lemon right by the water, and chase it down with an ice cold beer." “A bowl of fried chicken, skins only,” said Lee. “Then, a bowl of pork rinds in gravy and hot sauce, and a bowl of oxtails in a pool of liquid bone marrow.” Topping his feast off with a pint of 20-year-old bourbon. Fry thinks the end of the world is a great time to really indulge in some of his favorite dishes. "I'd start with a whole, wood-roasted, garlicky Dungeness crab with some crusty bread for sopping up the juices,” the Southern chef said. “Then, I would work my way into a plate of L'artusi spaghetti -- it’s a simple, yet really super technique. For my main course, I would opt for a USDA prime, and slightly dry-aged, bone-in ribeye cooked in salted butter with thyme. But, I would only eat the cap or spinalis and the fatty tail piece.” With the steak Fry would also have a plate of roasted marrow bones, wood-roasted porcini mushrooms, some hot, rustic bread, and a simple green salad. “For dessert,” he continued, “I would have to have a stack of Minetta Tavern fries, cooked in duck fat and topped with an almost too salty duck gravy and a side of Tabasco.” Dinner complete! Of course, we’ll need to wash all this down with a tasty cocktail. To toast the apocalypse with a sprit made from the Mayan’s homeland, master sommelier Richard Betts, maker of Sombra mezcal, shared an end-of-the-world smoky margarita recipe with us. After all, if we are going to go, might as well go all out. Take a sip and tell us below, what would be you last meal? Shake and serve on the rocks, with or without salt. Linnea Covington is a freelance writer in Brooklyn. Her last meal would consist of a classic Manhattan made with Whistle Pig to go with a fiery green chili stew, fresh tortillas and crackling carnitas. This would get followed by a rich and bold bottle of Barbara, cheese fries with enchilada sauce from the Denver Diner, and big bowl of raspberry and dark chocolate gelato.